There are lots of interesting looking gadgets on the market that claim to do wonders but they don't. This little one actually does what it says on the packaging. It is called Epistick and is a spring coil that removes unwanted facial hair with the exception of eyebrows as they require more precision. It works on the basis of threading, or plucking the hair out. Perhaps it looks complicated but if I can do it anyone can. 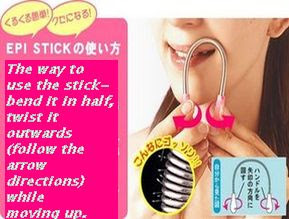 After a few attempts I found it so easy to use and now every few days (if you are dark haired like me) I simply distract myself with TV while I tidy up my top lip. Yes, it does hurt a little bit but then everything else that involved plucking or waxing hurt even more. My skin is very sensitive and goes red very quickly but with Epistick to my relief there are no problems at all. To clean it you just blow on it to remove the hairs. Before I bought mine I did a bit of a research as I usually do and it looks like Epistick variations have been on the market for few years now. Even though I have not seen them in the shops in U.K the Epistick is easily available on www. EBay.co.uk for around £2 including the shipping. I don't see why I should pay more if the cheaper tool does the job. Such great value for money, probably the most useful tool I bought recently I think.